Creating truly interactive ebook apps has been a task that’s been aimed more at children’s content like Alice in Wonderland or non-fiction work like Al Gore’s Our Choice. But a new transmedia publishing company is trying to breathe life into fiction novels, showcasing the written word and storytelling while enhancing it with an array of interactive elements. Chafie Creative Group, based in Dallas, is introducing a new iPad app (s aapl) called Immersedition, the first in what it believes is a new form of interactive book-reading apps. 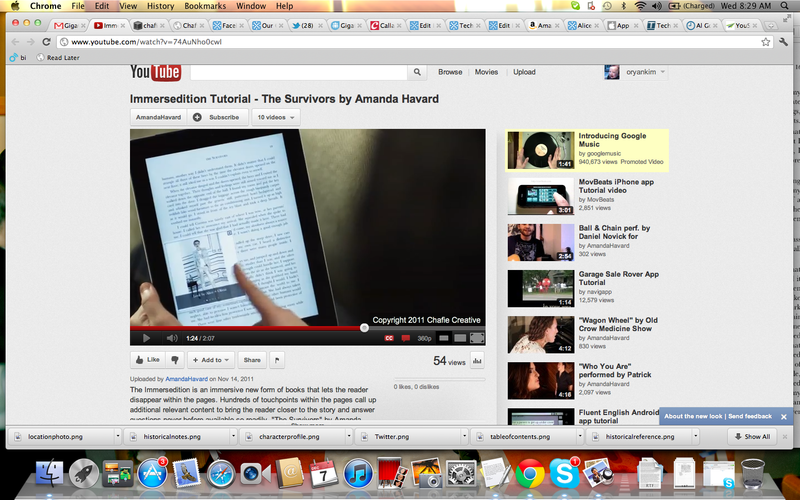 The app will feature as its first book a story called The Survivors, a young adult piece of fiction from new author Amanda Havard, who designed the story to ultimately be an enhanced media experience. The 283-page book, which went on sale earlier this year in print and tells the stories of descendants from participants in the Salem Witch Trial, includes 300 touch points that reveal 500 interactive frames of content embedded in the pages of the book through watermarks. The watermarks reveal things like historical facts, maps, photos, videos and character profiles that change depending on where in the story a user is. There’s also embedded music including three original tracks that can be turned on at key points. And there’s even live Twitter profiles from five of the main characters, who continue to tweet and add background to the story. All of the content works offline except the maps and Twitter feed. The book works to preserve the reading experience for people, enabling them to still engage their imagination. So it doesn’t include images of the actual characters and instead shows runway shots of what they might wear. But it does include more than 50 location shots to give a broad sense of what a place looks like without getting into the details. The idea is to augment the reading experience and keep people involved while still respecting the traditional reading process. A lot of the existing enhanced ebooks are children’s books that bring almost game-like elements into a story. Others like Our Choice employ infographics, videos, images and other elements that allow people to get deeper into the book as if it were a museum display that can be pinched, zoomed and manipulated. But it’s trickier to apply some of these elements to a novel, which can suffer if certain elements are too literally enhanced. Go too far and people feel like you’re robbing them of the experience of creating images in their head. Don’t go far enough and people will wonder what the point is of making the book interactive. But I think just like we’re seeing with other books, we’ll see more publishers look to make fiction novels more interactive. I think it does have to be applied intelligently. And some books with some historical connections or a lot of locations might lend themselves better to this approach. But the right facts, background and extra details here and there can make the experience work well and deepen the engagement of readers. I don’t expect we’ll see all the classics get the ebook treatment overnight, but Immerseditions shows that it can work for new novels.